Might as well get your week started off right with some crazy good deals on storage for your devices. 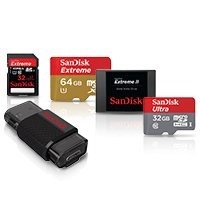 Today's Amazon Gold Box is full of SanDisk cards and drives for up to 79% off retail. Of primary interest to us are the microSD cards and microUSB OTG flash drives, but there's something for everyone. Some particularly good deals are the class 10 microSD cards, which are going for $29.99 for 64GB ($70 off) and $14.99 for 32GB ($55 off). It's a bit more if you want the allegedly speedier UHS-1 rated cards. You could also grab a microUSB OTG flash drive for $17.99-29.99 (32GB and 64GB). Those are both 40% off the retail price. A bit out of our purview, but still interesting are the deals on SSDs, standard flash drives, and CF cards. Take a look, but remember these are one-day deals. And yes, they all have Prime shipping.